We were recently asked about what gift to give a college student who lives in a dorm. Our thoughts immediately went to the new Keurig 2.0 K200/K250 Brewing System. Designed with a smaller, more compact footprint, the K200/K250 (the difference is extra accessories) is sized right for small kitchens, dorm rooms, small office spaces (we have one on our desk). The best small footprint single-serve machine we’ve tried, it takes up half the space of our Keurig 2.0 K450. 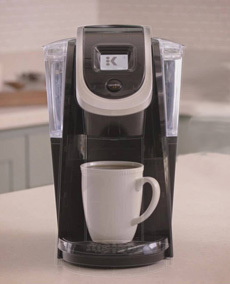 The Keurig 2.0 series brews a single-serve cup or 4-cup carafe (the carafe is an extra purchase and uses a larger pod). It’s also good for homes that don’t brew a lot of single-serve coffee. If you just brew one or two cups in the morning and/or evening, why take up the space with a 70-ounce water reservoir? The SRP is $109.99. Learn more at Keurig.com. Small footprint, big convenience: the Keurig 2.0 K200 series. Photo courtesy Keurig. Coffee purists won’t use K-cups. They want their beans freshly ground. There have long been single-cup coffee makers, but this is the first grinder we’ve personally that’s great for small brews. 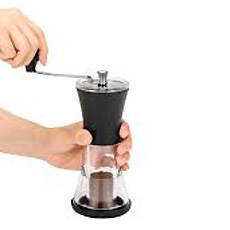 It’s sized to grind the beans for one or two cups, instead of an entire pot. It’s the right gift for the coffee lover who wants to brew freshly ground beans. The grinder has a highly durable ceramic grinding mechanism; the adjustable dial enables fine to coarse grinds. A nice addition is the non-slip silicon base that provides stability when grinding.